Perhaps you are the type that’s comfortable with constantly trying different foods, or perhaps not. Either way, the tapas experience is an essential part of any Barcelona holiday. Catalan cuisine is both delicious and varied, and these bite-sized portions are perfect for sharing with friends. 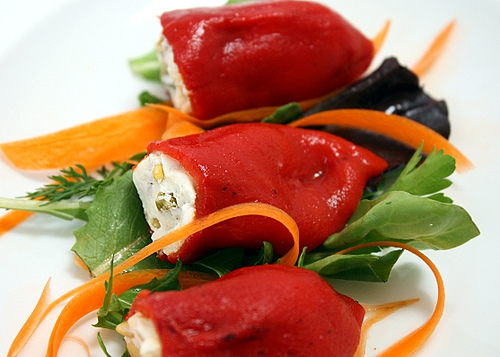 Here are some suggestions for you to consider when you explore the best tapas in Barcelona. Think a Spanish take on French fries, because that is what patatas bravas in Barcelona resemble. This savory snack of fried potatoes topped with a unique spicy sauce is a tapa that everyone craves! Luckily you can find this tapa almost anywhere in Barcelona, and each time will be a different experience because every restaurant adds their own twist. 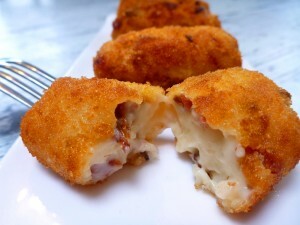 Resembling croquetas, these Barcelona tapas taste like cheesy mashed potatoes. If you’d like something different to croquetas, but containing the same great taste, these are a good option. 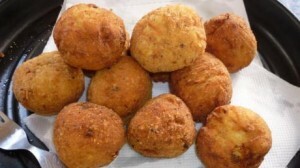 Barcelona’s “bombas de queso” are always a great choice when searching for a quick and filling snack to keep you going. 4. Croquetas – Some of the Yummiest! These little fried bites can have many different fillings and a taste you’ll love. Whether you are a ham and cheese fan, a mushroom fan, or chicken fan, you’ll love the croquetas in Barcelona. From mouthwatering ingredients mixed with mashed potato on the inside, to the crunchy breaded coating on the outside, “croquetas” will hit the spot every time. 5. Tortilla de Patatas is a Tasty Tapa! Get the image of a flat, tasteless round used for tacos and burritos out of your head. Now think thick, fluffy, potato and egg-filled omelet. Choose from a variety of different tortillas, made with courgette, chorizo, onion, and other vegetables. This is either served warm and fresh, or cool, and is a delicious tapa in Barcelona. 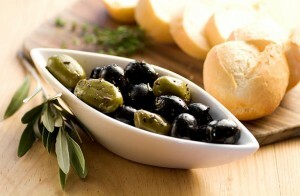 6) Olives – Truly Scrumptious! Olives can be prepared in numerous ways, but rumor has it that Spain does it pretty well. When you are out for tapas in Barcelona try ordering olives when you see them. Each chef marinates them differently, some using garlic and different seeds, while others add Spanish wine and an assortment of fresh seasonings. One thing to keep in mind when ordering olives in Spain is that they are sometime stuffed with anchovies. If fish is not what you are seeking, be sure to mention this. If you are a cheese lover, then this is an obvious choice for you. Cheese platter tapas come with a variety of cheeses, ranging from the best Manchego and other goat cheeses, to more mild and fresh tasting cheeses. If you are served bread at the table, be sure to save a little for when the platter arrives, as most cheeses taste best atop a warm crunchy slice. Sausage tapas in Spain come in many varieties such as “chorizo”, “botillo”, “salchichon”, or “morcilla”. Their sweet meaty tang envelope your taste-buds and whether served cold or warm their different flavours are quite unique. 9) Mushrooms are a Marvelous Thing! If you consider yourself a mushroom lover, then these tasty treats will capture your heart and stomach! Mushroom tapas are often prepared with olive oil, garlic, and fresh seasonings, perfectly combined to bring out their own flavours. Much like most tapas in Barcelona, every chef prepares these differently, so try them out a few times, and see which tapas bar has your favorite mushrooms. The choice is yours, but if you pick one of these ten suggested tapas in Barcelona, you will leave satisfied every time. Each one is loaded with insanely great tastes, leaving your palates wanting more. Maybe next you will be ready to leave your comfort zone and try something new after such a successfully delicious experience. Feel free to leave us a comment below! This entry was posted in Home, Restaurants & Food and tagged Barcelona food, Barcelona tapas, bombas de queso barcelona, catalan sausage barcelona, croquetas barcelona, eating in barcelona, pan con tomate barcelona, patatas bravas barcelona, stay in barcelona, tapas, things to do in barcelona, Tortilla de patatas barcelona, visiting barcelona, where to eat in barcelona. Bookmark the permalink.